If you have pain, swelling, discomfort, or bulging veins in your legs, these varicose vein testimonials from Maryland Vein Professionals clients will prove that varicose vein procedures can eliminate your pain. Especially because it’s summertime! Cynthia Felt An Immediate Improvement. Cynthia visited our offices to discuss her first procedure, said Dr. Jonathan Calure. She was looking forward to a summer of being able to show off her legs instead of hiding them. 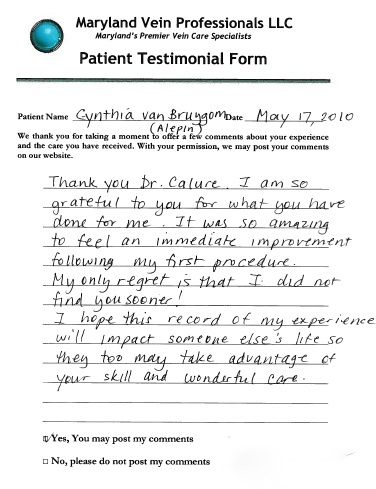 It was so amazing to feel an immediate improvement following my first procedure, added Cynthia replied. My only regret is that I did not find you sooner! Cynthia A.
Richard Found The Entire Experience Very Easy. Janet Had A Painless Procedure For Her Painful, Swollen Legs and Ankles. For years I have suffered with painful, swollen legs and ankles. The vein closure procedure was painless, and I saw results almost immediately my ankle swelling was reduced and the heaviness and pain in my legs decreased significantly. For More Information About Varicose Vein Procedures, Contact Us Today. To read more of our varicose vein testimonials, or to find out more about varicose vein procedures, please visit www.MDVeinProfessionals. Or call us at 877-7-MD-VEIN for a free physician screening.